The Delta Conservation District is a “unique” local unit of Government, which utilizes state, federal and private sector resources to solve today's conservation problems. The guiding philosophy of the Delta Conservation District is that decisions on conservation issues should be made at the local level, by local people, with technical assistance provided by government. Conservation Districts are referred to as “gateways” in our local community. We provide linkages between land managers and a host of conservation service providers that include state, federal and local governments, conservation organizations, and Internet resources. The District continually scans the needs of our community, works in partnership with others involved in conservation to set local priorities, and develops action plans to solve natural resource problems. The delivery of these efforts by the District allows citizens to manage their private lands for a cleaner, healthier Michigan. It allows the public a point of access in their communities when questions arise on how to manage natural resources. 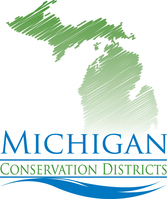 The Delta Conservation District is a unique local unit of government that was formed in 1951. The district is run by a five member board of local directors that are elected by county residents to four (4) year terms. The mission of the Delta Conservation District is to assist all county residents with information, education, and technical services in all aspects of natural resource and/or environmental issues, specializing in local assistance to non-industrial private landowners. All Conservation Districts are stand-alone entities who work with many state and local agencies. There are 75 conservation districts statewide with diverse, ever-changing programs adapted to each county's needs.